We are blessed with many children. I use Kiswahili to present it. It is us who suffer insiders are hyenas. Truth is what I am seeking, yes. I point at it like a warrior, a hero is sitting. There is danger we don’t need chemicals to be drunk. We don’t believe them and they are dangerous. and in good schools and universities. We don’t ask as if our tummies are full. 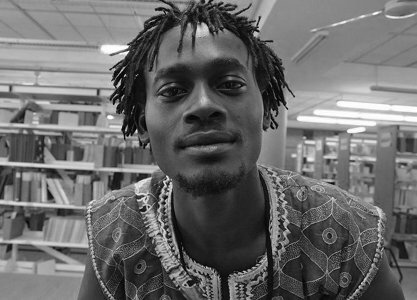 Grandmaster Masese is a Kenyan poet, actor, and writer as well as a Fahamu Pan African Fellow on Social Justice. He is also an Obokano player – a traditional harp from the Gusii community in western Kenya. Masese has performed in festivals across Kenya, Ghana, Senegal, India, The UK and Tanzania. He has been featured in numerous Kenyan online magazines. He has a band called Ritongo Afrika and is also a member of the Mstari wa Nne poetry group and Al Hazira FM comedians. He currently has three students who he teaches to play the Obokano – two young girls and the renowned poet and visual artist Mama Charlotte Hill O’neal.